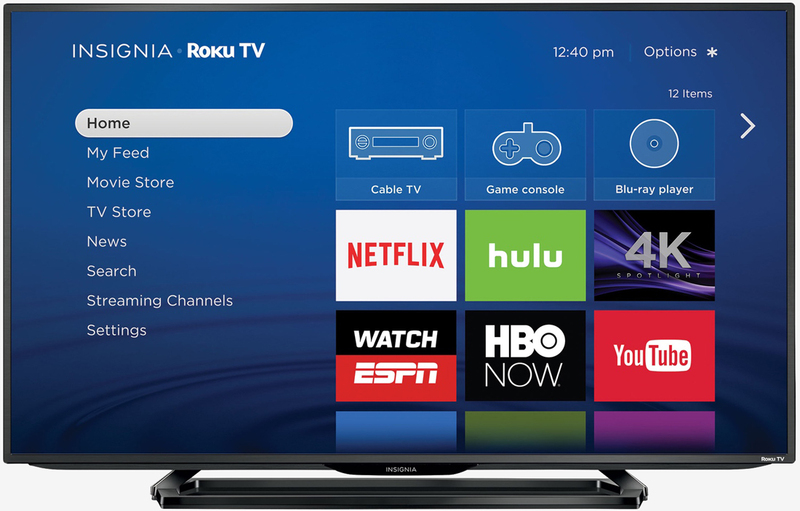 Roku revealed earlier this year at CES that it was partnering with select television manufacturers to integrate its streaming set-top box hardware directly into new 4K sets. On Thursday, the first batch of sets from those partnerships broke cover. The 4K UHD (3,840 x 2,160) Insignia Roku TVs are now available to purchase on Best Buy's website and will be landing in stores early next month. The sets are offered in 43-inch, 50-inch and 55-inch screen sizes priced at $399.99, $499.99 and $649.99, respectively. All models feature a 60Hz refresh rate and are equipped with a quad-core processor and 802.11ac dual-band Wi-Fi, we're told. They also include a standard remote although users can optionally download the free Roku Mobile app for Android and iOS devices to control the television from their mobile device. A Roku-branded TV goes a bit deeper than just having set-top box hardware inside as it's also loaded with the Roku operating system. What's cool about this approach is the fact that users don't need to cycle through inputs to access devices on different ports; everything is all grouped together on the same screen. Integrating popular streaming devices into televisions appears to be the wave of the future. Late last month, rumors suggested Google was working with another budget TV maker – Vizio – to integrate Chromecast-like functionality into future sets. Models could arrive as early as this spring, sources said.